Turning the traditional concepts of construction contracting on their head, alliancing seeks to harness the synergistic benefits of co-operation and collaboration between the project participants. Research suggests that alliancing can work, at least in a commercial sense, delivering improved time and cost outcomes. However, it comes with increased risk for the owner of a project in the event that the project encounters unforeseen difficulties or the efficiencies promised by co-operation and collaboration do not materialise. Whether, from an owner’s point of view, the increase in risk is justified – having regard to the potential advantages of enhanced co-operation and collaboration – is a difficult commercial question, which depends upon the type of project, the alternative contracting model, the previous relationship of the parties and the personalities of key management. 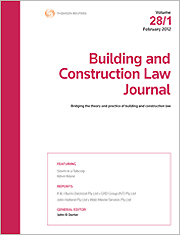 For the PDF version of the table of contents, click here: BCL Vol 33 No 2 Contents.